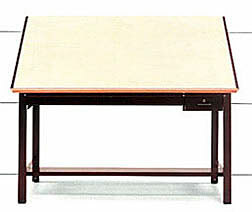 Mayline Ranger Steel 4-Post Drafting Tables are simple, yet stately, offering uncommon strength and durability. Known as the toughest table on the market. Steel four-posts feature heavy duty rigid steel construction. Features:Hardwood top with steel end cleats, 37" high and tilts from 0-50 degrees angle. Base has hardboard dust cover to protect drawer contents. Legs have floor protecting feet. Tool Drawer:(Standard on Ranger) Comes with insert tray and lock. Ranger drawer operates on plastic glides.